Leading High-Reliability Organizations in Healthcare details the attributes and practices that help high-reliability organizations (HROs) excel in the service they provide to their customers. Explaining what it takes to achieve high reliability in healthcare settings, it defines reliability as much more than just being safe, it describes how to measure reliability and paves the way to higher reliability. The book presents proven tools, concepts, and skills that leading healthcare organizations are using to improve safety and quality, including mistake proofing, Lean Six Sigma, and reliability engineering. It details the roles and responsibilities of the two key organizational components involved in achieving high reliability: leadership and the reliability "engineers" who apply reliability methods both technically and socially throughout the healthcare value stream. Rick Morrow, executive in HROs and now System Director of Quality, Safety, and Process Improvement at CHRISTUS Health, one of the largest non-profit healthcare systems, identifies the necessary infrastructure, methods, and analytics required to achieve and sustain higher reliability. 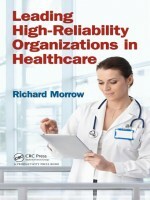 He also suggests applications of high reliability concepts that have proven to work well in healthcare settings. The book includes numerous case studies that illustrate success stories of healthcare organizations achieving higher reliability, some achieving zero defects for years. It also contains case studies that examine examples of failures, so you can avoid making the same mistakes.